I want to create a keyboard shortcut to i.e. open Firefox while I am working in another application. I know I can use ⌘ CMD+T when I am in Firefox to open a new tab. 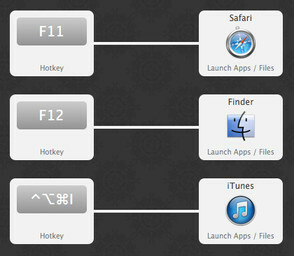 I haven't found a way to create that kind of shortcuts in System Preferences. Karabiner stopped working in 10.12 due to changes in the kernel architecture, and Karabiner was rewritten as Karabiner-Elements which uses a new JSON format for the configuration files. 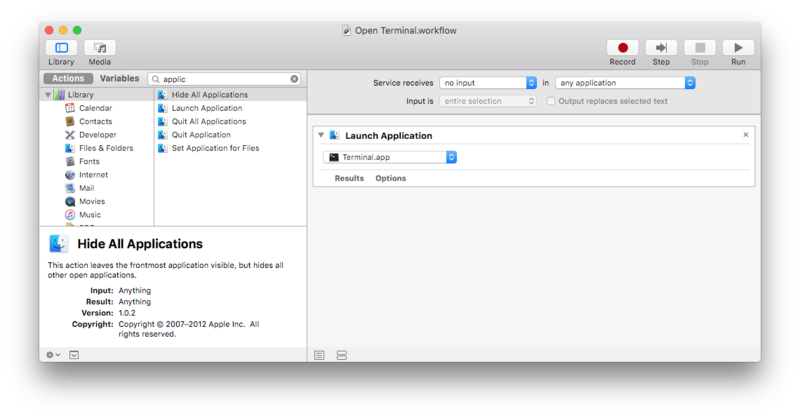 Open Automator, select "Service" as the type of the document, change "Service receives" from "text" to "no input", add a "Launch Application" action, and save the service. Then assign a keyboard shortcut for the service from "System Preferences > Keyboard > Shortcuts > Services". I don't recommend this option, because at least on my system, there is at best a delay of around half a second before an application is focused by a keyboard shortcut created using this method, and the delay is often even longer. There has also been a bug since 10.7 where the keyboard shortcuts for Automator services don't always work until you hover over the services menu from the menu bar. (Edit: it's now 8 years after I wrote this answer and the bug still hasn't been fixed.) Also the keyboard shortcuts for services are not available in some applications like Emacs. 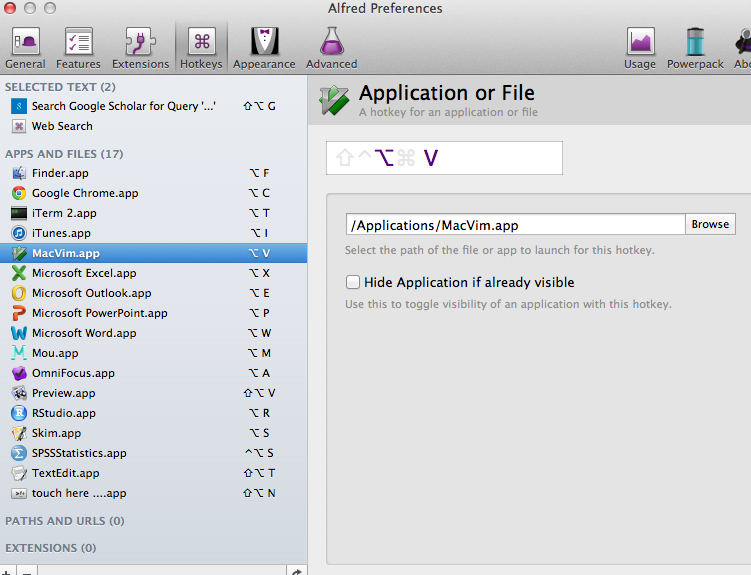 Alfred, in its Power Pack version, can map shortcuts to applications, among many other features. If you do not want to use third party apps. 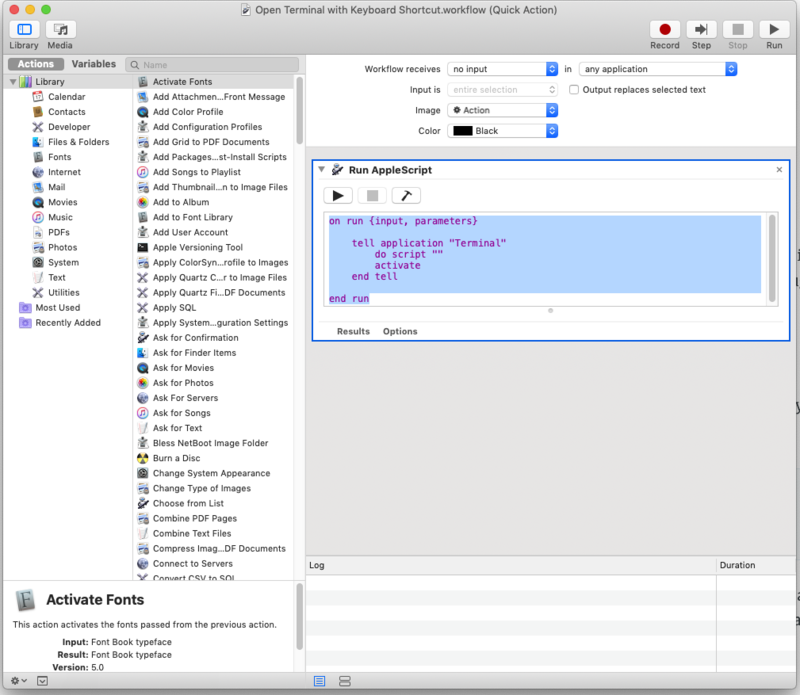 Then you can use Automator (Services ), and the Built in keyboard shortcuts. Here is how in an answer to a similar question. In Step 3, of creating the service. Set it to 'any application' . Update Jan 2012: Blacktree no longer updates Quicksilver--the developer went to Google and has released Google Quick Search Box. Quicksilver lives on, but it has a new home at qsapp.com. There are plenty of good options here but I wanted to add my personal favorite which I've been using since 10.5 and still works on 10.11.2: Spark 3. Spark is a powerful, and easy Shortcuts manager. 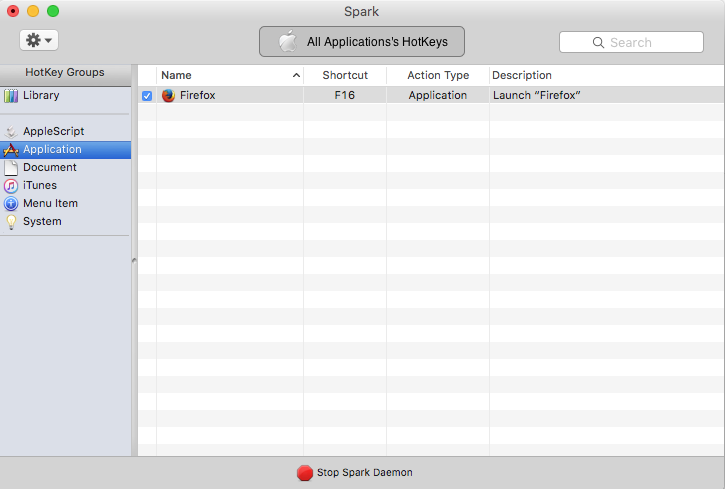 With Spark you can create Hot Keys to launch applications and documents, execute AppleScript, control iTunes, and more... You can also export and import your Hot Keys library, or save it in HTML format to print it. Spark is free, so use it without moderation! I know Alfred has already been mentioned, but I thought I'd say a little bit about choosing shortcut keys. It was not obvious to me at first what would be a good set of shortcuts that was (a) easy to remember, (b) easy to use, and (c) did not conflict with other system or application shortcut keys. I ended up using the "alt" key as the basis, and generally relying on keys that can be triggered by the left hand, and choosing descriptive letters (e.g., x for Excel). this allows you to have the mouse in the right hand and the shortcut keys triggered with the left. Another benefit of using Alfred Hotkeys to activate an application is that if an application is hidden, it will be unhidden. I found Apptivate the easiest to use. You just select an application and you assign a global shortcut. That's it. PS: Remove do script "" if you don't want a new instance of the terminal every time you press the hotkey. In the left column, click on "Services"
Scroll down to the very bottom, you should see the script you just saved. Click on none to assign a hotkey to it. One important thing to consider, though, is that the hotkey must be unique across all applications. If you assign a common hotkey, such as ⌘ + T, and try to open the terminal while browsing, it will conflict with most browser's hotkey to open a new tab, so it won't work. That's why you should try a shortcut that won't conflict with any app. I've chosen ⌘ + ⌥ + F12. Works pretty well. If you're using iTerm2 + Oh My Zsh, just replace Run AppleScript with Launch Application in Automator, and select iTerm.app from the list. Not the answer you're looking for? 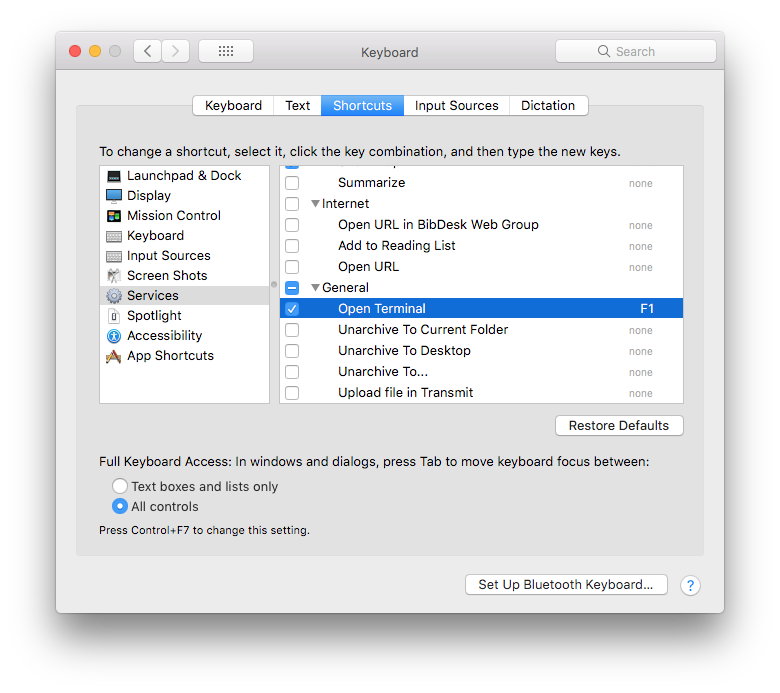 Browse other questions tagged macos keyboard shortcut . How to open terminal in Mac using keyboard shortcut? How to create a keyboard short cut (F7) for example to launch the terminal app? Is there a faster app switcher than a keyboard shortcut linked to an Automator service? How can I map the “Eject” key on a Microsoft keyboard or create a new shortcut for locking my screen? How to assign a service keyboard shortcut for a specific application (non global)? Can i create a global shortcut to run my last terminal command? Why do macOS application-specific keyboard shortcuts involving modifiers: ⌥, ⇧ not work with latest Chrome?